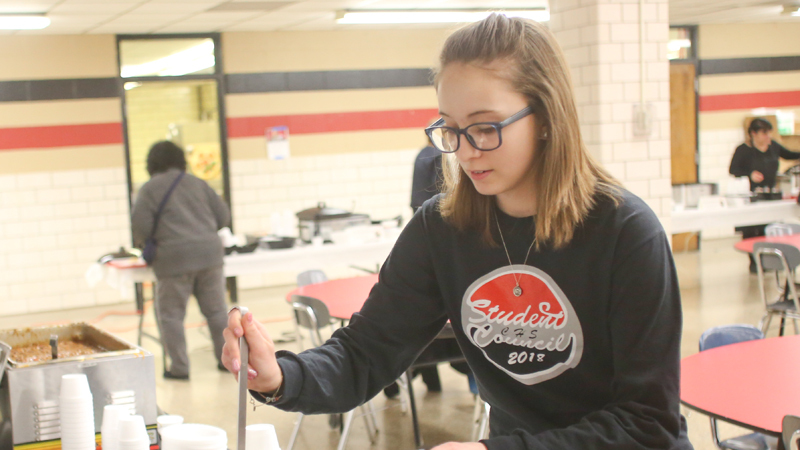 It was a battle of the heartiest, the spiciest and the most unconventional batch of chili at Canfield High School on Friday evening. This reporter, who judged the entries, left the second annual Cardinal Chili Cook-Off with a full stomach and a burning mouth. The school tries to have an event such as the chili cook-off every quarter to invite the community indoors. Geordan said he tamed the spice down from last year, but other chili entries in the category brought the heat. He took judges’ top pick in the hot and spicy category for the second year in a row. “We believe that the school is the heart of the community, and why shouldn’t we open our heart?” he said. Skyline Chili, a restaurant chain in the Cincinnati area, is a staple for Beth Schutz and Sabrina Eaton. The restaurant’s chili inspired the recipe for the mother-daughter duo’s unconventional category-winning batch of chili. Without revealing all of the ingredients, one of the prevailing flavors of Schutz’s and Eaton’s chili is cinnamon. “It’s a weird recipe,” Schutz said. Eaton, an eighth-grade teacher at Canfield Middle School, likened the experience to a MasterCard commercial. “Making chili with mom: priceless,” she said. The other draw, Geordan said, is to have businesses participate and become known in the schools. Cocca’s Pizza received judge’s choice in the Thick and Hearty category. Unlike some of the other entrants in this category, Cocca’s chili was in fact thick in consistency, but not hearty enough that this reporter couldn’t finish his bowl. Several classes and student groups entered the cook-off. Melissa Dahman, student council president, said she doesn’t like chili but wanted to help the school. “I think it was a good experience and a good way to reach to the community and let them know that the student council exists,” she said. After judging, the school opened to the public for an all-you-can-eat chili dinner. Money donated to the school for the chili cook-off went toward the Committee to Support Canfield Schools.